Offit Kurman family law attorney Cheryl Hepfer was interviewed on BBC radio‘s “Radio 5 Live” show. The topic of the segment was prenuptial agreements. The topic is currently a popular one in the UK as there are plans to make the agreements binding. Cheryl comments on the types of clauses she has seen built into prenuptial agreements that do not involve money. The host then ask her if the rumors are true about Facebook’s Mark Zuckerbergs prenuptial clause setting a number of date nights for him and his wife. Click here to check out the segment and listen for Cheryl at the 02:13 mark. 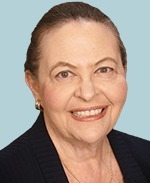 Cheryl L. Hepfer’s practice focus includes family law and domestic law, negotiation, alternative dispute resolution and collaborative law. She is the President of the International Academy of Matrimonial Lawyers and was the past president of the American Academy of Matrimonial Lawyers.